Asus is apparently preparing to release a new version of their 27-inch Asus VG278H 3D monitor that does not come with built-in IR emitter or 3D Vision 2 glasses bundled. The new model name is Asus VG278HE, much like what Asus did with their previous 3D Vision-Ready model VG236H and the VG236HE that also did not include 3d Vision bundled. This time however Asus did announce something different and new in the Asus VG278HE display – support for 144Hz refresh rate, something that was not available in the VG278H model. So what Asus is trying to do with the VG278HE is clearly target it at gamers that are not that much interested in stereoscopic 3D support, though the monitor is still 3D Vision-capable if you get an additional 3D Vision kit, but want to have even higher refresh rate when playing in normal non-stereo 3D mode. Other than the support for 144Hz refresh rate (the first LCD monitor to support that) and the lack of built in IR emitter and bundled 3D Vision glasses the rest of the specs of the display are pretty much the same as with the Asus VG278H, though the new model should be available at a more affordable price. 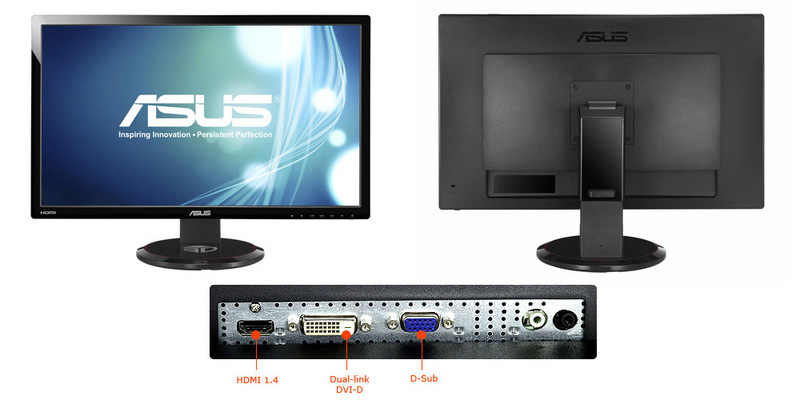 Have in mind that the 144Hz refresh rate is not supported in stereoscopic 3D mode, only in 2D and it should only be available when using the DVI interface with a Dual-Link DVI cable, even though Asus is not totally clear on that, not to mention that the 144Hz refresh rate is also not mentioned in the manual of the display where the supported resolutions and timings are listed. Furthermore Asus talks about HDMI 1.4 and stereoscopic 3D support, but this monitor does not have a built-in IR emitter, so how did they manage to provide that with an external IR emitter for 3D Vision is another thing that is not yet very clear. I guess we’ll have to wait some more time for the product to become available on the market, so that we can see it in action and test it and compare it with the VG278H. This way we’ll learn more about the new 144Hz mode and the claimed HDMI 1.4 3D support. 144 hz is rather confusing to me. I mean how many games will even let you play at the hz? I dont really play games in 2d anymore so maybe I am missing something. Something about this unit strikes me as VERY ODD. I think the reason for requireing external emitter is due to the large amount of defective emitters in the last batch. lol I was going to say the same thing…confusing. could it be that some combination of 120Hz and 24Hz could offer a better movie experience? 144Hz could V-sync at 120Hz, 24Hz on the fly based on content? I noticed the difference of 60 hz to 120hz is HUGE. I fell in love with 120hz with my first 3d monitor. Will 24hz extra offer anything noticeable in games, blurays, etc…? I have a GTX 680 if that makes any difference. yeah, weird. No built in emitter is bad for non pc 3d use. Like, you cannot use the ps3 with it I guess. I hope this drives down the cost of the prior model as I want that one still. I wonder if it has the lightboost. So it’s only worth when it will work in 3D mode. I understand why no emitter. Last time they sold model with emitter built in. It had a large amount of defective emitters. This means everyone who had to return/ replace. Had to ship a 20 pound monitor and this hurt asus alot. The 144hz makes 0 sense. I understand why people would want it. “Competitive gamers” would want it because they say it gives them the advantage. However…. how would a game support 144hz? New games as of last maybe 2 years support 120 hz and thats not too many. Most games are almost console ports in that regard and are capped at 60hz. Ive even seen a few 30hz capped games. Its like buying a PS4 right now. Sure you got the system but where are the games? Do today’s games get their resolutions and maximun HZ info from the EDID of the monitor? If so, then those games will be able to use 144HZ. I know that in C&C Generals I could to go in and tell the game my max resolution when I got my 1920*1200 monitor because the game was written before that resolution was available. My old CRT monitor that I used for 3D mapping (about 5 years ago now) could do 144 Hz @ 1280×1024 with just a Quadro card (before 3D vision LCD solution). It does definitely reduce eyestrain as the frequency for shutter glasses increases. Too bad Nvidia 3D vision can’t do it… or can it? It’s not a hardware issue at all… 27″ 1920×1080 @ 144Hz in 3D is a winner for me. What’s the ETA? 8months for US + another year or so after that for Canada… boo. Actually, 144Hz is used in every 3D cinema (well, I’m not exactly sure about those based on XpanD solutions, but all the rest are 144Hz). What I mean is: L1 R1 L1 R1 L1 R2 L2 R2 L2 R2 L3 .. etc. With 144Hz you get: L1 R1 L1 R1 L1 R1 L2 R2 L2 R2 L2 R2 L3 … etc. It would be nice for 3d gaming as well, because 72Hz per eye would result in smoother experience, but yes, most games are only designed for 60Hz, some even for 30Hz as some people already said, meaning the ingame animations are only 30/60Hz. I’m a CRT user, and I’ve played some games in 3D at 144hz (72Hz per eye), and even at 160Hz (80Hz per eye) and every motion appear smoother (but at the cost of lower resolution – 1152×864@144Hz and 1024×768@160Hz in my case). I hope in the future 3D display manufacturers and interface groups will get their act together and go for 144Hz 3D for the active solutions. And later on – to 240Hz ;). But what I really hope for is 3D gaming to switch mainly to VR headsets (HMDs) like the upcoming Oculus Rift, this is how real 3D immersion will come to life. And although both frames for each eye are displayed simultaneously in such devices, they also can benefit from 72Hz per eye, or 120Hz per eye in the far future :). So there’s an appeal to HDMI/DisplayPort: make it happen ;). I just remembered that 240HZ is doable right now!!! Sony does it for their PS3 console. I believe that 24″ is too small for effective S3D and they may be using the poor sales of their 24″ monitor to hold back on larger ones. Surprisiongly they have not done anything in the S3D arena for PC users. Actually true 240Hz isn’t doable with the current level of LCD technology, or at least with good quality and affordable end user price. There are still issues like crosstalk/ghosting even at 120Hz due to the use of overdrive to increase the reaction speed of pixels. There is a lot of hope for OLED technology, but it is still too expensive for larger screen displays, and then there is also the question about the lifetime of such panels. Like Zerofool said, we could have 3d with 3 full images per eye at 144hz (like “triple flash” in theaters). So it would be VERY nice if Nvidia 3D Vision glasses AND drivers could support 144hz 3d on this monitor. Now we’re waiting for your review to find it out ! I have just bought the VG278HE monitor and I am interested in buying a 3dvision kit. As my laptop does not have any DVI port, what would you recommend me to do ? Is buying an adapter from DVI to HDMI my only option ? Could I consider an adapter from DVI to VGA ? Any comment/suggestion will be welcome. My laptop indeed have a mini Display Port. Are you 100% sure that a mini Display port to DVI-D Dual Link adapter will allow me to use 3DVision ? Does any particular requirement exist for this adapter ? the adapter should be an active one in order to be able to support the higher bandwidth requirements for 1080p at 120Hz. Also check if your laptop has Nvidia Optimus technology as if it does the chances that you would be able to use 3D Vision with it are not very big – the two technologies do not play well together. If you install the 3D Vision driver and don’t have the Stereoscopic 3D control panel in the Nvidia Control Panel then you might not be able to use the laptop with 3D Vision on the external 3D monitor.